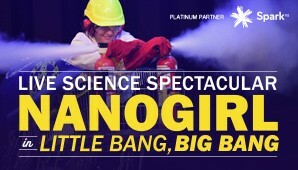 Join Nanogirl (Dr. Michelle Dickinson MNZM) and Boris her trusty lab assistant for science as you have never seen it before. Explosions (lots of explosions), liquid nitrogen ice-cream, hovercraft, smoke cannons - science and engineering will come to life in the coolest ways possible, right before your eyes. Nanogirl explains the science behind each experiment in a way that’s fun and easy to understand. We start with a small experiment to explain each idea (the Little Bang) - often with the help of a volunteer from the audience - then Nanogirl and Boris take the same principle and turn it up to Big Bang scale!